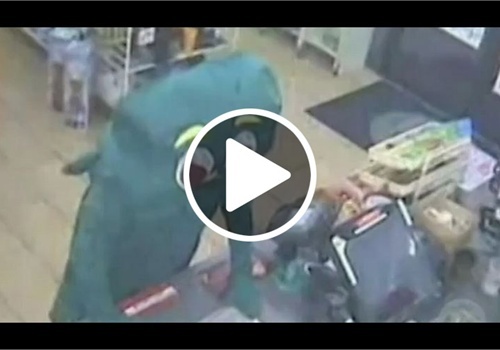 A suspect wearing a Gumby costume attempted to rob a San Diego-area 7-Eleven convenience store earlier this week, and was forced to leave the store after he was unable to produce a weapon. San Diego Police are now searching for the suspect, who walked into the Rancho Penasquitos store at 12:30 a.m. Monday. Store surveillance footage shows him entering the store with his hands raised above his head with another man. Gumby walked up to the store clerk and said, "This is a robbery." The clerk thought it was a joke and said he had to go back to cleaning. Gumby reached back into his pocket as if to take out a weapon, but the costume impeded his efforts. He then walked out of the store, after dropping 26 cents. Police are still searching for the robber. Gumby was originally the lead character in a stop-motion animated television series that ran from 1955-1989. The show was created by Arthur "Art" Clokey and his wife, both of whom created the character during his time as a student at the University of Southern California.